Poet and translator Shu Cai (Chen Shucai) was born in Fenghua, Zhejiang province, China, in 1965. He graduated in 1987 from the French Department of Beijing Foreign Studies University, then joined the Chinese diplomatic corps, serving from 1990 to 1994 in the Republic of Senegal. 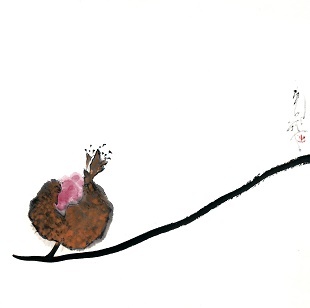 In 1999, with Chinese contemporary poetry splitting between “Intellectual” and ”Folk” strains, he and fellow poets Mo Fei and Che Qianzi initiated the “The Third Way”, believing each poet should find his or her individual path. His published work includes the poetry collections Alone; Short Poems; Selected Poems; and Rhythm Practice, along with Glimpse, a volume of essays. His books of translations are Selected Poems of Pierre Reverdy; Selected Poems of René Char; Selected Poems of Yves Bonnefoy (co-translated with Guo Hong’an); Selected Greek Poems (co-translated with Ma Gaoming); and Nine French Poets. 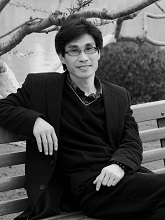 Among his honors are the 2005 Xu Zhimo Poetry Prize and the 2011 Laurel Translation Award of China. In 2008, he received the France’s “Médaille du Chevalier dans l’Ordre des Palmes Académiques”. Recently he has taken special interest in children’s literary education, teaching poetry classes through the internet. 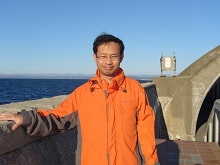 A literature Ph.D., and member of the Foreign Literature Institute at the Chinese Academy of Social Science, Shu Cai lives in Beijing, Dali (Yunnan Province), and Paris. Jean Valentine was born in Chicago, earned her B.A. from Radcliffe College, and has lived most of her life in New York City. Her first collection, Dream Barker, won the 1965 Yale Younger Poets Prize. Her 13th book of poetry is Shirt in Heaven, published by Copper Canyon Press in 2015. Door in the Mountain: New and Collected Poems 1965 – 2003 won the 2004 National Book Award for Poetry. Among her many other honors are the 2009 Wallace Stevens Award from the Academy of American Poets, as well as fellowships from the National Endowment for the Arts, The Bunting Institute, the Rockefeller Foundation, and the Guggenheim Foundation. 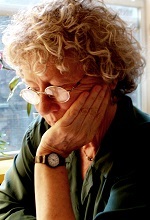 She served two terms as State Poet of New York, and was recognized in 2014 by the American Academy of Arts and Letters for exceptional accomplishment in literature. Jean Valentine has taught at Sarah Lawrence College, the Graduate Writing Program of New York University, Columbia University, and the 92nd Street Y in Manhattan. Wong Leung-wo is currently assistant professor in the Department of Literature and Cultural Studies at The Hong Kong Institute of Education. Among his honors are three Hong Kong Youth Literature Awards, 1st prize in poetry from the 2nd Hong Kong Biennial Awards for Chinese Literature, and two 1st prizes in fiction from the Hong Kong Biennial Awards for Chinese Literature. He is also the recipient of five Hong Kong Library Creative Writing awards, and the Big Thumb Poetry Prize. His books of poetry are Surprising Hair; The Pomelo Lamp; Millstone in the Fire; Ode to the Tree Root; Unborn; and About Time. He has published the fiction volumes The Curse of Fish; Broken Hell; and Cockroach Metamorphoses. His essay collections include Autumn Water; Between Mountain and Water; Fish Talk; and The Centauress and the Castle. His critical books are On Yu Guangzhong and Wong Kwok-pun and Opening the Window of Poetry: Dialogues of Hong Kong Poets. Share the post "Spring 2016"